Germany and France may become leaders of solar energy in Europe, despite their traditionally cloudy climates. In Germany, thousands of buildings have had solar panels installed, with these energy systems providing approximately 7% of the country’s energy last year. France is seeing similar results, especially as solar energy begins to grow more prominent throughout the country. Both Germany and France are growing more aggressive concerning solar power, which may secure the growth of this sector in the coming years. Earlier this week, world leaders met in France for a United Nations summit concerning energy efficiency and emissions reduction. Germany and France both rank among the top countries when it comes to energy efficiency, and officials from these countries have been highlighting the potential benefits of solar energy. Both countries may serve as examples for others interested in renewable power, largely due to their aggressive support for solar power as well as their focus on efficiency measures. Over the past decade, Germany and France have been working to move away from traditional fossil-fuels, as well as nuclear energy. These countries have been growing more supportive of renewable energy in an effort to become more sustainable, environmentally friendly, and take advantage of certain economic benefits. Combined, Germany and France receive an average 1,600 hours of sunlight every year. Warmer countries see nearly double the amount of sunlight, but Germany and France have established a major lead in the race to build solar energy capacity. By the end of this year, renewable energy is expected to account for some 33% of all domestic power generated in Germany. This is compared to the 10% the United States is expected to see in the same time period. 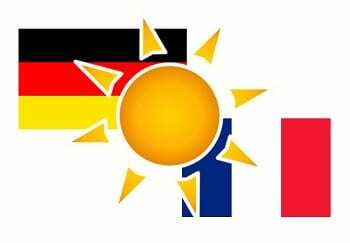 Germany has established itself as a prominent solar energy market, with France following closely behind. Both countries are likely to encourage others in Europe to embrace solar power in the coming years.